a. 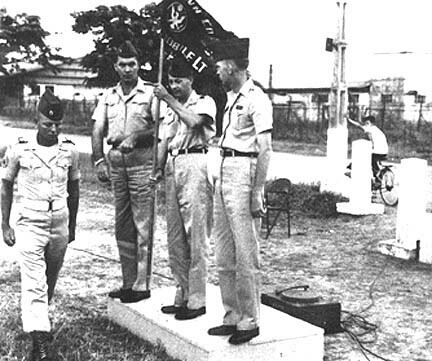 33d Transportation Company (Lt Hel) changed to 118th Aviation Company (Air Mbl Lt)...."
The actual Guidon banner in Change of Command photo above in 1963, as it is today! when he DROSed in 1965. Upon the redesignation of the 33rd Transportation Company to the 118th Aviation Company(AML) on 25 June 1963 and the transfer of all assets and personnel, the stage was set for the 118th to further evolve and become a prime means of airborne assault... But with CH-21 Shawnee's? Jack Phillabaum, Operations Officer of the 33rd/118th recalls: "Because the H-21 helicopter wasn't the most trustworthy aircraft in the world, all H-21 missions(except maybe "milk runs" into TSN) were flown with two ships, even if one would do. this put an excessive amount of time on these complex aircraft and resulted in considerable numbers being down for maintenance. 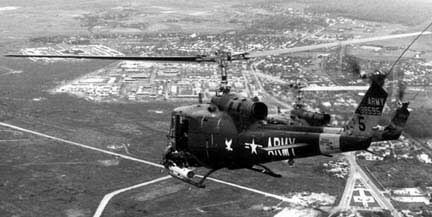 When the 118th became operational with the UH-1B on 16 Sep, 1963, we continued flying two ship missions, briefly. But, shortly after this, I asked permission to go to single ship missions and it was approved!" It is hard to imagine today a combat assault using the large, slow and often underpowered "Flying Banana." They were very effective over the previous year or so but some limitations were apparent in the high density altitude conditions of S.E. Asia. No doubt the planners of Army Aviation had something in mind such as the deployment of a new helicopter named the HU-1 or "Huey"! Personal remembrance, written at the time! Alan Laya, CH-21 pilot and HU-1 pilot during the change over remembers: "The HU-1's finally began to arrive but not before we were involved in one more combat assault north of Phan Thiet. With B-26's, T-28's and Armed Huey's(UTT), the mission was a success. The landing zone was beyond belief; an area large enough for a single ship, but rough enough to never want to see it again. We had four LZ's and flew in flights of four so each approached his respective LZ at the same time. I had to drop the aircraft over a tree line then try and bring it to a hover because of the mounds and tree stumps. With ten troops on board, I couldn't salvage the landing and had to bring it to the ground. Fortunately, we hit solid ground with no forward roll, but on the next lift into the area, we were not as fortunate. I landed on a mound knocking the big beast(H-21) to one side. She started to tip on the left side but we did have enough power to straighten her and bounce her in again this time level. In leaving the area the trees in front of us presented quite an obstacle. I can still feel that front wheel clipping the tree tops as we pumped the collective trying to retain power to get airspeed and then altitude. Another day, another combat assault, a few more gray hairs and another trying day for the nervous system. That day will always be memorable because it was the last time I flew an H-21! 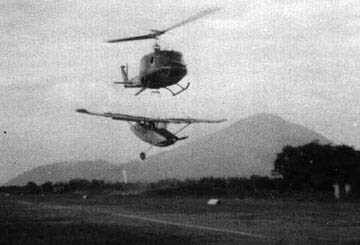 We had our HU-1's waiting for us in Saigon." at Phan Thiet. "Road Runner" was one of the CH-21's that was flown on the last mission. Here we see the aircraft marked as chalk "3". LT Edward J. Henderks, CPT George E. Leaf and LT Alan B. Laya. LT Dave Kenny; CPT Geary D. Martin. The arrival of 15 UH-1A helicopters for the (UTT) Utility Tactical Transport Helicopter Company in the fall of 1962, announced the beginning of the end for the CH-21's. The UTT, later designated the 197th Avn Co. and later still the 334th Avn Co., continued to operate as a sister unit to the 118th throughout the Vietnam War. (Note--See excellent book Primer of the Helicopter War, by Charles Holley and Mike Sloniker, Published by Nissi Publishing , Grapevine, TX for more details about the chronological history of Army helicopters in Vietnam). The actual date of complete replacement of all the CH-21's , as remembered by Jack Phillabaum the Operations Officer, was 16 September of 1963. The "Bandits" were activated with UH-1B helicopters and supported the CH-21's until they were replaced(see picture below). Jack Phillabaum, Operations Officer of the 33rd/118th remembers; " The first UH-1B operational mission was actually flown on 15 Sep 1963. 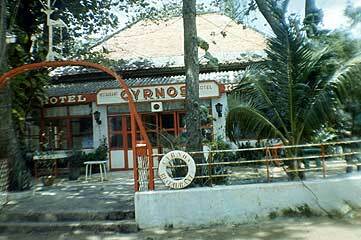 A mission request came in asking us to fly to Tay Ninh to pick-up an injured civilian, at night. I requested permission and permission was given,(from who I don't remember) to use the UH-1B instead of the H-21. With Lt. Chad Payne in one aircraft and me in another, we received a radar vector from Tan Son Nhut while an Air Force A-20 flew overhead cover, and we completed this first UH-1B mission for the 118th." The 118 AHC with its UH-1B gun ships became the first Assault Helicopter Company in Vietnam and in Nov 63 the "Bandits" were credited with 150 kills(according to 145th CAB History). 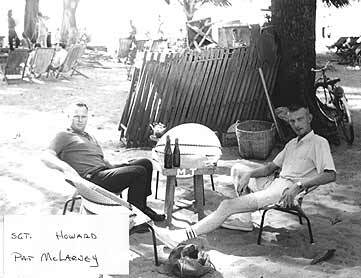 VHPA records indicate that the last casualty in a CH-21 was lost in 30 Aug 63 when CPT James Wenzel and 1LT Timothy Lang were apparently shot over the Iron Triangle. And, the first recorded death of a crew member in the 118th flying a UH-1B is listed as 2LT Lynn H. Rothenbuhler on 28 Dec 63. Wayne Wright, a 63-64 "Thunderbird" remembers: " We received either 24 or 25 brand new UH-1B's to replace the CH-21's. All the aircraft were in tail number sequence. I believe the last tail number was 22063 or 22064 with the last one being the maintenance ship. The first 8 were 1st PLT, with red tails, second 8 were 2nd PLT, with blue tails and the last 8 were 3rd PLT Bandits, with yellow tails. Seems to me the last one (maintenance) had three narrow stripes of all three colors. Don't remember exactly when we got the UH-1B's but it must have been October 1963. We were transitioned by a training team right at Bien Hoa Air Base and my flight records show I began transition training into the "Huey" on Sep 18, 1963. " The UH-1D's came almost a year later. Anyone having specific knowledge of the actual dates of the 118th losing the CH-21's and gaining the UH-1B's or UH-1D's is encouraged to contact the Web master. Determining the origin of a military patch can sometimes be a very difficult task. It can be especially difficult for a patch for a small unit such as a company or detachment. These small units are theoretically not authorized to have a Distinctive Unit Insignia(DUI). Only units of the size of Battalion or Regiment are authorized a DUI patch because, among other things, the components of the patch design and the symbols or Latin motto used are highly researched and carefully selected to insure that other unit patches are not "infringed" upon or plagiarized. Throughout the history of the United States many, many military units with DUI's have come and gone, and research is a necessary part of the effort to design a unit patch or crest. Of course lots of things were different in Vietnam! Following the redesignation of the 33rd Transportation Company to the 118th Aviation Company(Air Mobile Light), the commander, MAJ David B. Hayes, wanted to change the unit patch from that of the 33rd Transportation Company(on the left above) to something entirely different. 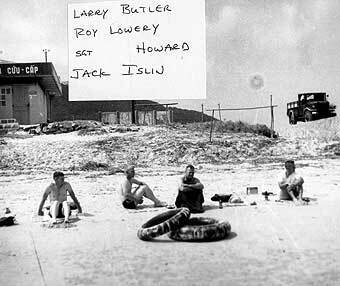 During the late summer of 1963, several pilots within the 118th were asked to help with the task. Among them was a young Lieutenant named Jack Todd who remembers the story of how it happened below! "Major Dave Hayes was a very proud Armor officer. He wanted a unit symbol that was befitting an assault aviation company. The 33rd Transportation patch was not especially to his liking. Dave Hayes did not think that the 118th Aviation Company was in the transportation business, only. He was a warrior and he wanted something in keeping with the warrior spirit. And, he wanted a unit patch that carried warrior symbols and portrayed a warrior message! Remember, in 1963, the War had not really started. There was no Long Bien bureaucracy. So, Major Hayes could do about whatever he wanted! " " Major Hayes wanted the colors of the three Combat Arms (Red, Yellow and Light Blue and Army Aviation-Teal Blue) on the unit patch design. He told me to develop the idea. So, I had my wife send me a picture of the 416th Signal Aviation Company patch that I had helped design several years earlier. (See patch above) I had been an Aviator from 1960 until 1962 in the 416th Signal Aviation Company based at Fort Huachuca, AZ. The Disney Studios had designed that original patch for the 416th. From World War II, the Disney Studios had designed many patches for military units that requested their help as a patriotic service...free of charge." "Their was no plagiarism or copyright issues involved, since the 416th patch had never been adopted or worn on uniforms. I wrote Walt Disney Studios and asked if they would allow us to modify their design and they dutifully wrote back that it was OK with them since they developed it for me and Chester Mead, and if we were happy, they were happy! I felt that I had a patch that would work." "I showed my idea to Major Hayes. He loved it...although he wanted Armor Yellow as the background color instead of the teal blue we all know. I was able to convince him that the predominant color should be that of Army Aviation. He reluctantly agreed and directed that we develop a prototype!" " 'Cheap Charlies' tailor shop on Tu Do street in Saigon made the original rendition of the 118th patch. Major Hayes made the final color selection. He loved the diving Eagle with the Thunderbolt. The yellow color he selected in honor of his Armor heritage! To this day I believe he wanted yellow as the background color." "I believe we were the first Army Aviation unit to put a logo on the front of a Huey that was not a unit designator. The Eagle looked so good and later made its way to the battery compartment, also. " "Major Hayes also had each platoon's aircraft tail rotor pylons painted yellow, red and blue (Infantry blue was not possible because I believe Captain Jim Hughes or Captain Frank Radspinner, the 573 Transportation Detachment Commanders could not get the color right so Teal Blue went on the tail rotor pylons.) Now you know how the platoons came about having the color stripes on the tail fins!" "Jim Hughes and Frank Radspinner were very professional and experienced maintenance officers and Major Hayes was used to dealing with armored vehicle readiness rates and not Helicopter readiness rates. He drove those two esteemed gentlemen-- who were also very good guys--- nuts, when they told him all aircraft were not 100% ready. Accordingly, he blamed them for the non-Infantry dark blue paint." "The notch in the upper left of the "shield" came about after the third try by Disney. First was a circle which seemed boring because every fighter squadron in WWII had a circle patch. Second try was a diamond but the eagle was cramped and I wanted the eagle. The third try was the "notched" shape shield, which was very distinctive. I don't know where they got it." "Well, that's how it happened. Walt Disney Studios, Dave Hayes, Frank Radspinner and Jim Hughes caused it to happen. Me, I was just a young pilot trying to help a truly inspirational leader, Major Dave Hayes. And, thus begin a process that developed a terrific heritage of people who are all very proud to associate themselves with the 118th Aviation Company. The lessons I learned in the 118th have served me well in the rest of my life. God bless those who served and those who died!" The 33rd Transportation Company, 118th Aviation Company (AML) and the 118th Assault Helicopter Company were each located in the same place for 9 + years. This was not the case with some US Army Aviation units while in Vietnam. From the beginning, the 33rd was based at Bien Hoa Air base located about 30 miles NE of Saigon and to the east of the Song Dong Nai river. There was a lot of flat, open land on the south side of the Bien Hoa Air base. That was were the 20 CH-21 "Shawnee" were placed because of the need for lots of space. This old runway area was almost exactly within the circled NW/SE airfield and the name Ap Thanh immediately south of the Air base twin runways(See map above). 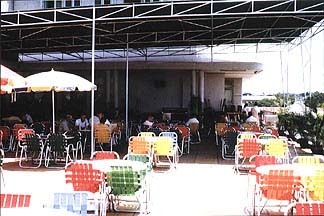 The Thunderbird parking area was know as the "Bird Cage" This later became referred to as the "Old Bird Cage" because a new 145th CAB parking area was developed immediately to the east about 500-600 meters. This new area is referred to as the "New Bird Cage". The initial issue of UH-1B's to the newly redesignated 118th Aviation Company (AML), arrived in Sept 1963. The unit received approximately 25 aircraft with successive serial numbers beginning at 62-02038 up to 62-02063. Those first UH-1B's remained until the newer and larger UH-1D's began to arrive in 1965. Arbitrary tail numbers were assigned and painted on the vertical stabilizer/tail beginning at 1st Platoon "Red bird 1", "Red bird 2", etc. to the test evacuating a USAF "Bird Dog"
Ted Jambon, tells the following story about one of his in country R & R's in Vung Tau......"When I was first in country, it was standard entertainment when we landed in Vung Tau and had to get to town we had to hire two horse drawn carts to take us. The deal was that the one who got there first would get the money for both carts. The drivers loved it and it would result in a wild race. Unfortunately, in one such race one of the horses died from over-exertion and the G.I. 's were ordered to pay up for the dead horse. That put the squelch on racing for a while. Then we switched to Lambrettas and cyclo racing." 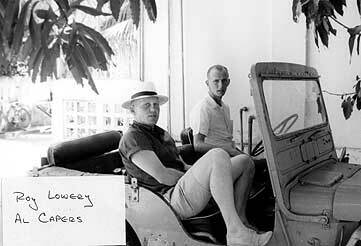 Roy Lowery and Al Capers in "acquired"
seeking shelter from the hot tropical sun. US troops looking for a break from mess hall food. 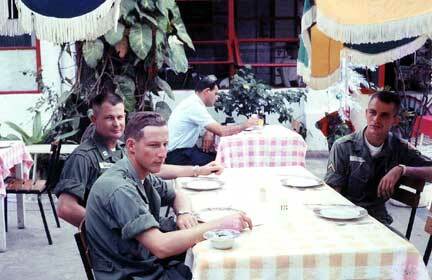 118th Crew Chiefs gathered for a little R & R at a Saigon bar in 1963! If you can help name any of the Crew Chiefs, notify the Webmaster. 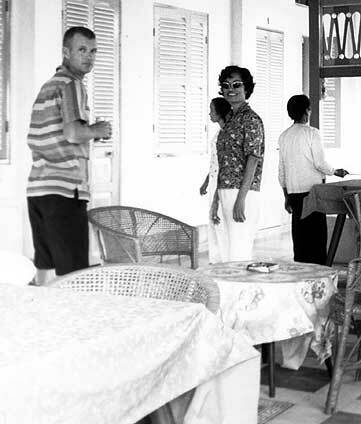 from the original walled canvas tents that were used for the first months in Vietnam. These buildings were constructed by RMK construction contractor. And, according to Wayne Wright, the Company area above was only for the officers. The compound above was actually built for RMK people, some of who still lived there in 63-64. 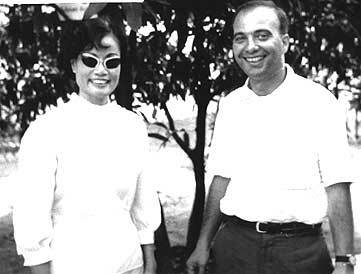 There were Vietnamese cooks and waiters and a fabulous Chinese baker that were paid from officer contributions. As Labor Control Officer, Wayne Wright collected piasters each month to pay the workers. Miss Kim and Duc worked at the bar and were paid out of bar proceeds. 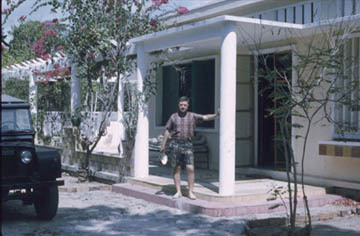 Finally, the more junior officer were moved out in mid-64 when the VNAF wanted the compound for their officers and families. 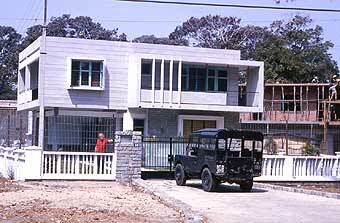 The 118th officers moved to the Company compound, into barracks style buildings alongside the Company HQ and Supply room, until the Cong Ly compound was occupied in August 1964. MAJ Joe Henderson. 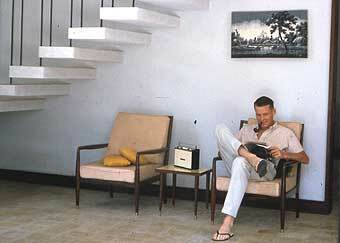 MAJ Hayes served as CO from July 1963-May 1964. 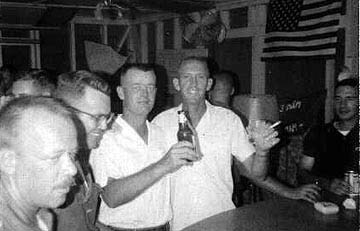 CPT George E. Leaf holds beer. Others, unidentified. The 118th Aviation Company (AML) was the premier helicopter unit in 1964-65. The Thunderbirds were often featured in Stateside newspapers, news footage and other publications. Being so close to the "Flag Pole" and sporting the brand new UH-1B's, the Thunderbirds were frequently "targeted" by AP photographers who wanted to "tag-a-long" to take pictures for the folks back in the USA. CPT Jack Grasmeder, Operations Officer during this time, provided the following copies of AP photographs that he was given. They were taken when the Thunderbirds supported an ARVN unit in the Duc Hoa area and the 173rd Airborne Bde near Bien Hoa. The UH-1D began replacing the UH-1B in the 118th Thunderbirds about July or August 1965. Gauging from the serial numbers of the UH-1D's in the Incident reports, most seem to be 1964 serial numbered. The "Brand new" UH-1D began replacing the UH-1B in mid 1965 in the 118th. The UH-1B had proven to be a much better 'performer' in the heat and humidity of Vietnam than the H-21. Many argued that it took almost twice as many helicopters to move a combat unit as it did with the older H-21's. This is a fair argument, however, the momentum was rapidly increasing to retire the aging "flying banana". With the increased size of the cargo area of the UH-1D and the larger rotor system, many expected more troops and payload could be carried than the UH-1B. However, this expectation really never proved to be true! The main reason was because the engine of the UH-1D(Lycoming L-7 and 9) was not significantly more powerful than the one in the UH-1B(L-5). Once the more powerful L-11 and L-13 engines began to arrive the UH-1D began to perform more to expectations. In the end, not until the arrival of the UH-1H and its significantly more powerful L-13 engine, did the Huey show significantly improved performance. Above is a 2nd Plt "Bluebird 6" UH-1D sporting the "Thunderbird" on the cargo door, nose and the white numeral "6" on a field of blue painted on the vertical stabilizer. Note that the white diamond, signifying the 145th Combat Aviation Bn., had not yet been adopted for the tail boom. "I became the Crew chief on the replacement "B" model for Blue Thunder 1 that was lost at Dong Xoai. It was designated Blue Tail 9, because they thought Blue 1 was a jinx. After a couple of days, when I had the cosmoline cleaned off head and tail rotors, Bob Rux, crew chief on Blue Tail 7, wanted my ship because it was the oddball. I didn't care as long as I had my own ship, so we traded. As near as I can guess, we got the "D" models between July and August 1965. As I remember, they would bring in a few ships at a time. I remember the "old mans" ship we called Rainbow 6. I believe it was the last to be changed out from a B to D Model." 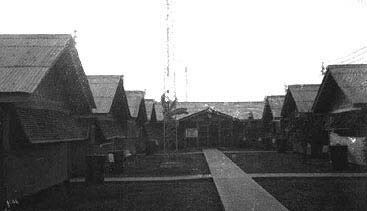 We finally got an out-house built by the 2nd Plt hooch. We named it " Blue Thunderbird 1"
Crew Chief for "Blue Thunderbird 7"
The infamous "Iron Triangle" was a triangular shaped area of land very close to Saigon where the National Liberation Front, aka Viet Cong, was rumored(and did) to have their COSVN headquarters. From Ben Cat NW to Ben Suc and then SE down the Saigon River to a point due south of Ben Cat, the "Iron Triangle" was almost within rock throwing distance of Saigon. Of course, Saigon was the nerve center and headquarters of not only all Vietnam forces, but MACV and USARV(before it was moved to Long Binh). The "Iron Triangle" was rumored to have all sorts of underground hospitals, vast supplies dumps and communications facilities. Over the span of the American involvement in Vietnam the Iron Triangle was bombed, assaulted and searched constantly. The area probably had more B-52 strikes concentrated on it than almost any other area in S. Vietnam other than sections of the "Ho Chi Minh Trail." This area was laced with tunnels that were interconnected with large underground base complexes housing the local VC and NVA that had infiltrated down the "Ho Chi Minh Trail." One of the largest tunnel complexes was inadvertently discovered when a tank from C Co. 1st 69th Armor caused a tunnel roof to collapse, causing the tank to fall into the complex. After the war it was found that there was a tremendous amount of underground tunnels and facilities and many of the rumors were true. The now famous Cu Chi Tunnels are a part of this area where many tourists are proudly shown today. In an effort to keep in check and search out and destroy the "Iron Triangle", several US units were based within very close proximity to the area in 1964-65. These units primarily including the 25th Div. at Cu Chi , the 1st Infantry Div. at Lai Ke and the 173rd Airborne Bde(Sep). and beautiful clear dry season sky. the LZ on the 173rd "Iron Triangle" operation. are from HQ Sec. C/1/503rd, 173rd Abn Bde(Sep). In 1967, the U.S. Army, in cooperation with the Vietnamese government, evacuated the villages of the Iron Triangle. The area was known as a staging area for the Viet Cong and the villagers were seen as givers of refuge and suppliers of support for them. By evacuating the area it could be defoliated and declared a free-fire zone, an open season on anything that moved. Hang Loose, more to come, if you will send me pictures and stories! !